After the Jews' return from exile, their priests retold the encouraging story of the nation's founding under Moses. They tended to emphasize the roles of earlier priests, like the sons of Aaron. Paul's goal in the letter to the Galatians was to free them from their self-imposed obligation to keep the old laws of Moses. He calls that old stance slavery, and assures us we are God's children and heirs. Luke's writings emphasize the wide spread of the good news through the work of unlikely messengers. Very early, shepherds, whom most held in low regard, hear the word of God from angels and begin to tell it to everyone. The Historical Situation: The Book of Numbers tells parts of the story of the Hebrews' journey from Egypt to the Promised Land, events that happened in the 13th century B.C.E. But the book as we have it was written much later. In the early 6th century B.C.E., the descendants of those earlier settlers were invaded and defeated, and many were taken as captives to Babylon. Their sixty years there are known as the Exile. When they finally got to return to their homeland, by then known as Judah, their priests wanted to help restore the nation. One of their methods was to revive a sense of the people's more glorious early history, so they retold a number of ancient stories from the time of Moses, producing what we now know as the Book of Numbers. The priests' vision of what was good for the nation included the restoration of worship in the temple, naturally enough. So ritual prescriptions and the duties of Levites and the sons of Aaron (priests in the historical era described in Numbers), dominate much of the book. Indeed, today's passage begins thus: The Lord tells Moses to tell Aaron to tell the priests, "This is the ritual way to bless the people." 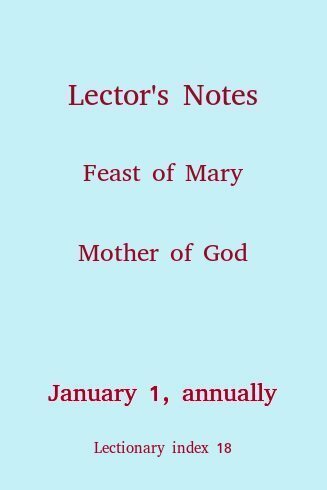 The Theological Background: Perhaps this paragraph is in the Lectionary today because the feast coincides with the civil new year in many countries, and the blessing formula is a nice way to begin a new year. But a key phrase in the formula bespeaks a breakthrough in our evolving understanding of God, "The Lord let his face shine upon you." Many ancient peoples believed that it was possible to see the face of God, but dangerous, often fatal, to do so. Ancient Israel shared this conviction for a long time (see Exodus 33:11, Deuteronomy 34:10, and Genesis 32:31, for example). But here their priests encourage the people to expect to see the face of God shining (smiling, perhaps?) on them. At least, that's the effect the priests predict for those who worship at the temple. This is a god still awesome to those who obey and worship him, but less dreadful than previously believed. That's progress. Proclaiming It: Don't rush this short reading. Distinguish the actual blessing formula from its surrounding imperatives. Pause a moment after "Say to them:" and pause again before "So shall you invoke ..."
If the essay above about seeing the face of God persuades you, then emphasize "The Lord let his face shine upon you." To get a feel for how that should sound, think about faces you have liked to gaze upon. Think of the face of a person you love deeply, or of someone with whom you have shared exceptional honesty and candor, or of someone whose courage you admire. How does it feel when you and that other special person let your faces shine upon each other? If you can express that feeling in your proclamation, you'll be faithful to the ancient priests' teaching about God's face and our blessedness. The Historical Situation: Among the Christians in Galatia, some were teaching that, in order to be saved, Christians still had to keep the Jewish law, even to the point of being circumcised. Saint Paul argues forcefully that there should be no such requirement. The Theological Background: Now the law of Moses was not a bad thing, but it promised more than it could ever deliver. Keeping the law could not save anyone. Salvation, Paul teaches, comes as an undeserved gift of God, which we accept by faith in Christ. Our position vis à vis God was effectively that of slaves when we thought we had to keep the Mosaic law; now ransomed from slavery, our position is the more favorable one of adopted children. Proclaiming it in Our Liturgical Setting: This passage is in the Lectionary today because, well, we need a New Testament reading not from the gospels, and this is a rare Pauline reference to Jesus' birth of a woman. The phrase "in the fullness of time" is also appropriate for the season. But to the author, those are details supporting the main point: that because of Christ our status before God (face to face with God, we might say) is now that of chosen children. Be sure to contrast with your voice the words that name our various statuses: ransom, adoption, sons (or children, depending on the translation), Father, heir. The ancient refugees, returning from exile to a desolate homeland, convinced that their exile had been in punishment for their sins, longed for a sign of divine favor and reassurance. Their priests assured them that in the temple the face of God would shine upon them. To our contemporary place of worship, we come with various dispositions, from the confident to the desperate. We do not expect literally to see the shining face of God. But we do see each other's faces. Our faces are the ones that God can use to express welcome, acceptance, mercy, reassurance, and love to the others here. Will we consent to let God use us so? 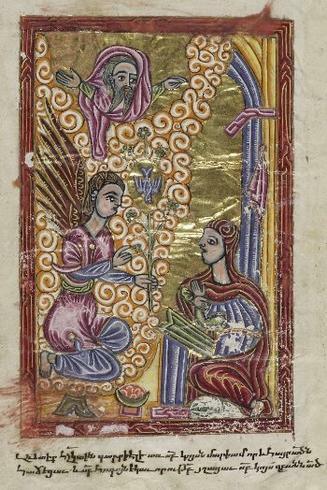 The Annunciation. From Illuminated Armenian Gospels with Eusebian canons, Bodleian Library, University of Oxford, U.K. Click here for larger versions, copyright info, etc. This page updated December 31, 2018.